Mr. Tom Murray is the Digital Learning Director for the Alliance for Excellent Education. If you're a school leader and you haven't already, I would strongly urge to check out the Future Ready Schools website and take the pledge for your district. I'm excited about the prospects of the Future Ready Leadership Network. 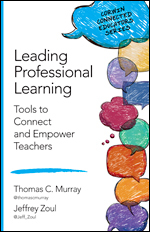 Also, don't forget to check out the book Leading Professional Learning, which he co-wrote with Jeff Zoul, my guest on Episode 34.